Having just moved to Boulder CO from Richmond VA a few weeks ago, I naturally feel a compulsion to take advantage of my new proximity to the snowy white powder of snow found in abundance at the many ski resorts in the region. No longer am I obligated to fly to ski. Now, for the first time in my life as a skier, I am able to travel by road. I immediately find myself eagerly plotting out routes and route distances to ski resorts I’ve always wanted to ski. I am thrilled to learn that there are over 10 resorts within a reasonable day trip drive from Boulder. Quickly, I look into buying ski gear and discount lift tickets, now that I feel as if I’m going to be skiing at least five times a week each ski season. First order of business, though, is obtaining the coveted Boulder bus system “EcoPass,” which provides free rides to the Eldora ski resort an hour from Boulder (not to mention rides throughout Boulder, as well as to Denver and its airport). Indeed, Boulder is the only small American city I know of where a bus pass is highly coveted by nearly all community residents – in stark contrast to other small cities, where a bus pass is of no value to anyone other than the “no choice” riders who are very low income, don’t own a car, or both. The EcoPass is weeks away from arriving, but I am unable to wait for it. Another option I fortunately discover is a DenverBoulder SkiCarpool.com listserve, where a large number of skiers regularly seek out riders to share in the gas cost to drive to a ski mountain. Happily, an option soon arises on the listserve. 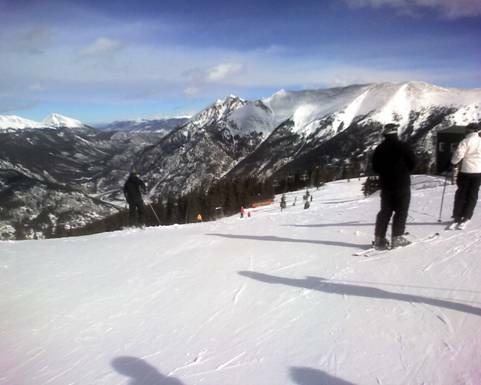 A woman is seeking a rider for either Winter Park or Copper Mountain, which are less than 100 miles from Boulder. I have never skied at either ski resort, so I send a note to her, and in a few days we are departing from my house at 6:30 am. We decide, only a few miles from Winter Park and Copper that we will opt for Copper. Difficult decision, as both mountains are similar in quality and today have nearly identical weather forecasts and ski conditions. Our decision turns out to be a good one. Copper, with an average of 282 inches of snow each year, has 2,450 acres of skiable terrain, 2,600 feet of vertical drop, and an abundance of 126 marked trails. Despite weeks of unseasonably sunny, warm weather in Colorado, on this day Copper provides us with wonderful ski conditions, and even provides us with a few inches of falling fresh powder in the afternoon. Despite this being my first ski day of the season, I confidently start out on a black diamond, and am surprised to learn that even though the trail – Formidable – is relatively demanding, I ski it exuberantly and happily. I enjoy Formidable enough to ski it three times as the day progresses. 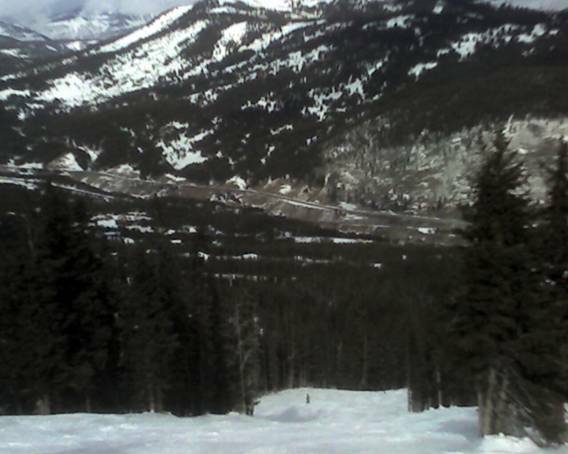 In fact, I am surprised to find that despite being an “advanced intermediate skier for the past several years, I find myself somewhat bored on the blue runs and tending to seek out mostly black runs on this winter ski day. The design of Copper is helpful for a newcomer to the mountain, as it is “zoned” by skill level. The east side is mostly advanced skiers, the middle zone is for intermediate skiers, and the western side is mostly for beginners. The chair lift speeds seem average at Copper, as is design which minimizes the need for skiers to engage in “poling” to ascend uphills. One problem I notice is that the directional signage is somewhat worse than average. On a number of occasions, I find myself needing to guess or recall from memory whether the unsigned trail I am looking for is the trail I am heading for. Many times, there are no directional signs pointing to named chair lifts.